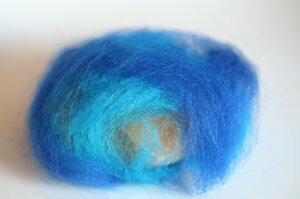 August 18, 2009 by Simone in "felt", "felting", "groundsel", "how-to"
Take a bit of wool roving and wrap it around your rock. I didn't want to fully cover my rocks so my layer is somewhat thin. 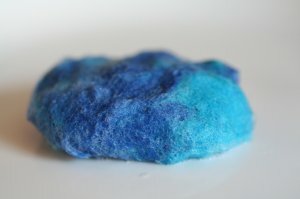 Using the dish soap and hot water, soap up your rock. 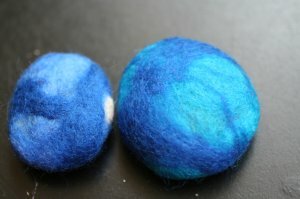 If you decide to follow Julie's hand felting method, continue to wash the rock, move it around, squeeze out a bit of soap, and continue to rub it until it is felted to your liking. 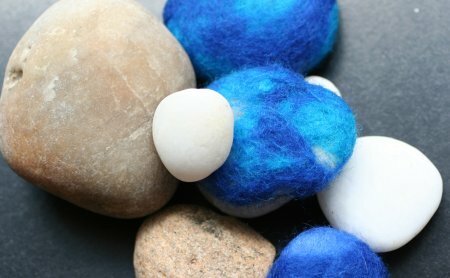 If you are hand felting, squeeze out as much of the soap as you can making sure that the rock is covered with the felt and let it dry. 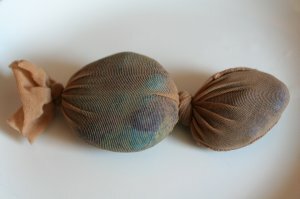 If you want to felt your rock in the machine, cut off a pantyhose leg, and begin to fill it with your soapy rocks tying off each rock separately so they don't felt against one another. I live in an apartment building that just got new machines. 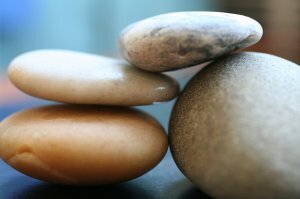 Because I didn't want to incur my neighbors' wrath, I limited myself to two rocks, tied those into my pajama pants, and washed everything together with a heavy blanket on hot. Margaret is much more courageous. She made a string of 19-plus rocks. Whether you follow her example depends on your living situation. So here is the outcome. 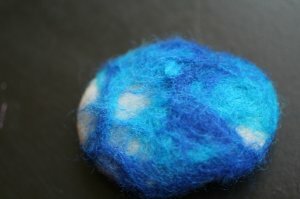 This is the hand felted rock. Not as smooth and somewhat fuzzy. These are the machine washed rocks. They are very smooth and quite perfect looking. All of them are beautiful, I think. It just depends what your personal preference is. Just one thing, if your super gets upset when you felt your vacation souvenirs in the machine, don't refer him or her to this blog.